The ABA’s Institute for Field Ornithology traces its origins back to 1983. It was created to offer novel opportunities for the study of birds. IFO programs combine education with field birding to enrich your appreciation of birds. (See below for more info on upcoming IFO Programs). Fresh off our sold out IFO Program in Philadelphia, PA, here’s a quick rundown on The Cradle of American Ornithology. Our group of 16 members along with instructors Ted Floyd, Bert Filemyr, and myself met up in Center City Philly for 5 days of educational birding. 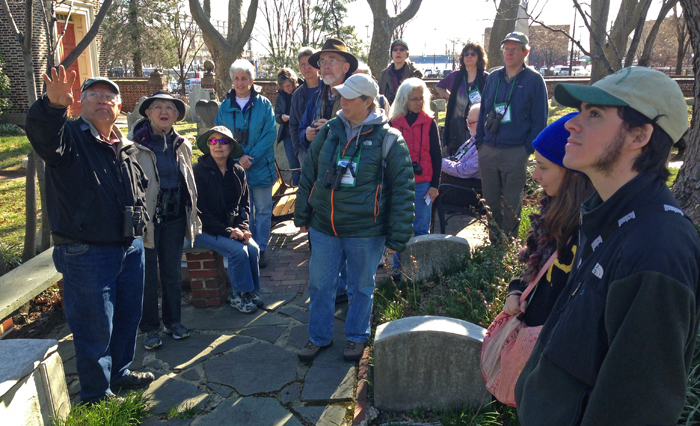 We retraced the steps of luminaries like Audubon, Wilson, Cassin, and James Bond among others, touring a number of historical sites. We also partook of some bird study ourselves, visiting several choice birding sites and seeing some fantastic birds along the way. 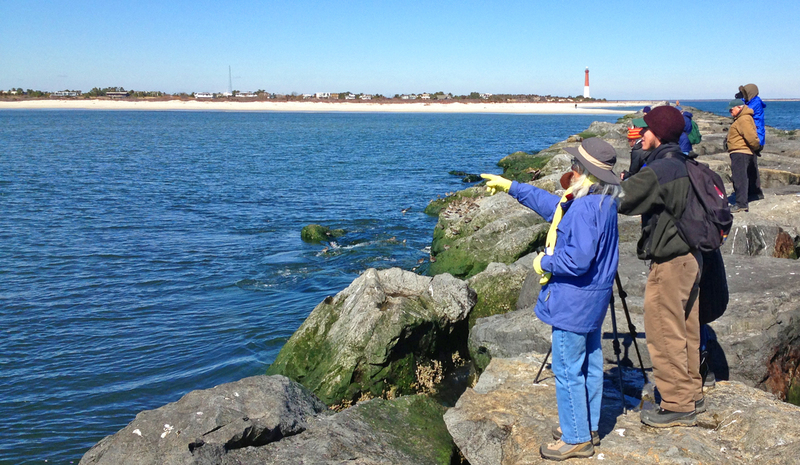 Here at Barnegat Light, NJ we enjoyed tremendous (practically broomstick-length) views of specialties such as Long-tailed Duck, Purple Sandpiper, Great Cormorant, “Ipswich” Sparrow, and Harlequin Ducks. We were blessed with good weather throughout as the picture above from Barnegat Light, New Jersey proves. In route to that magnificent birding spot we stopped near New Egypt, NJ, where two Northern Lapwings were still in place and satisfying birders. Also there were a handful of Pectoral Sandpipers, and mess of Wilson’s Snipe. 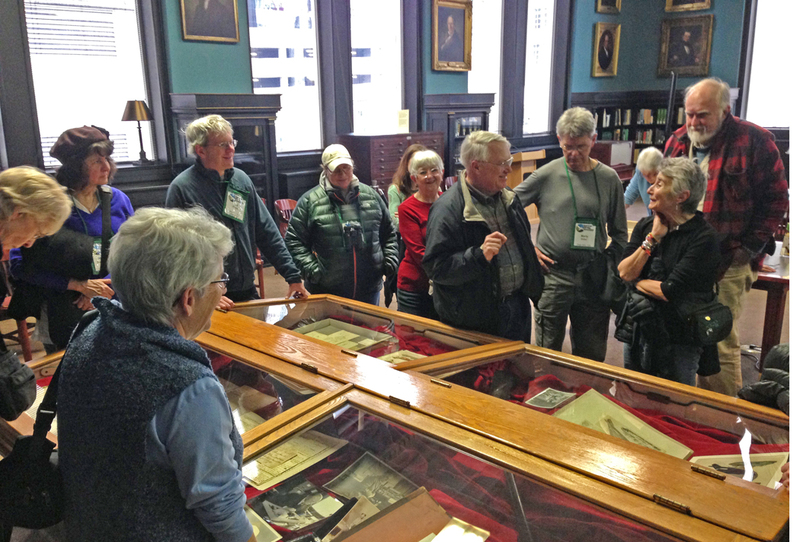 Instructor Bert Filemyr enjoys a lighter moment at the Academy of Natural Sciences’s library, while discussing the angst between rivals J.J. Audubon and George Ord. In the Academy of Natural Sciences archives treasures abound. We were privileged to see a range of rare and valuable historical artifacts including Alexander Wilson’s fowling piece, as well as original hand-written communications between Wilson and other famous ornithologists of his time. 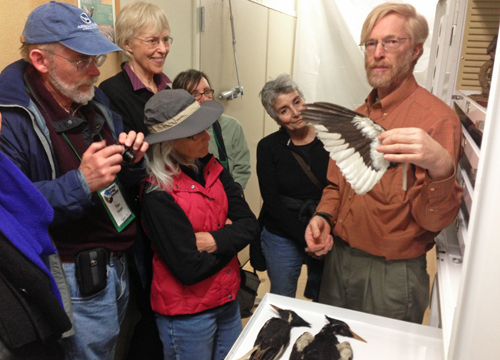 Doug Wechsler of VIREO shows us a spread-wing of an Ivory-billed Woodpecker from the Academy’s bird collection. A visit to the specimen collection yielded more treasures and we got to see actual Ivory-billed Woodpeckers, Bachman’s Warblers, a skull of a Great Auk, Passenger Pigeons, a couple of Heath Hens, Carolina Parakeets, and the last documented Eskimo Curlew (a specimen from Barbados, killed by a local hunter in 1963). A visit to Old Swede’s Church in South Philly, a national historic landmark, landed us at Alexander Wilson’s grave site. At Alexander Wilson’s resting place, Bert taught us about Wilson. He mentioned how Wilson wanted to rest some place where birds were flying above him. As if on cue, a Sharp-shinned Hawk cruised overhead. 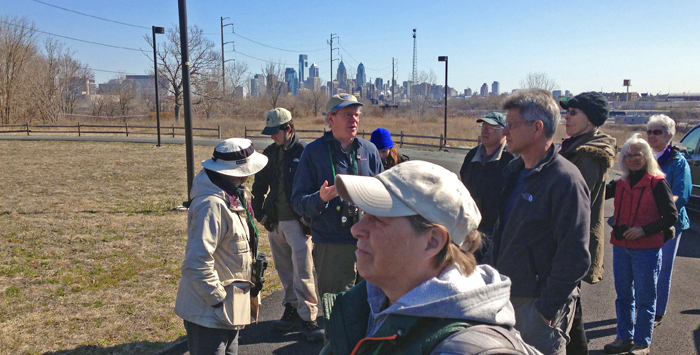 Never lacking for enthusiasm, Birding editor Ted Floyd is happy to be back on his old stomping grounds in front of the Philly skyline, birding Bartram’s Garden. Soon a Merlin appeared! On our last full day, we visited Mill Grove, the site of John James Audubon’s home, and also Bartram’s Garden, where both Wilson and Audubon studied American birds. While at Bartram’s we received an excellent tour by curator Joel Fry. Our perusal of the Gardens there netted us Yellow-bellied Sapsucker and a couple of Brown Creepers. The latter was described by Wilson from a bird he collected at Bartram’s. Also there we saw a live specimen of Franklinia (tea plant family), the most famous of the John & William Bartram’s botanical discoveries, and the plant featured in Audubon’s plate of the Bachman’s Warbler. It was a fantastic five days. Thanks to all who participated! Join us for this event in 2014. Bird migration is a spectacle of course, and no where is it more so than at Cape May, perhaps the most storied birding location in the ABA area. Three friendly local instructors have a long history with the area and teaching birders about this fantastic destination for birds and birders. identification, vocalizations, ecology, natural history, and conservation.